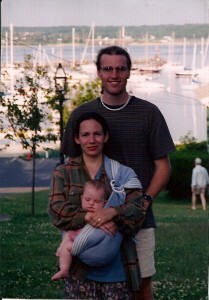 When my daughter Leah was born in 1996 I knew that I would wear her. Baby wearing was new to Salt Lake City, Utah and people always stopped and stared as I passed by. Even more people stopped to look when my husband Aaron carried little Leah in the sling. We loved slinging her! I could nurse her privately in public. I could take her anywhere, keeping her close, and still having my hands free. We didn’t own a stroller and we had no interest in getting one. 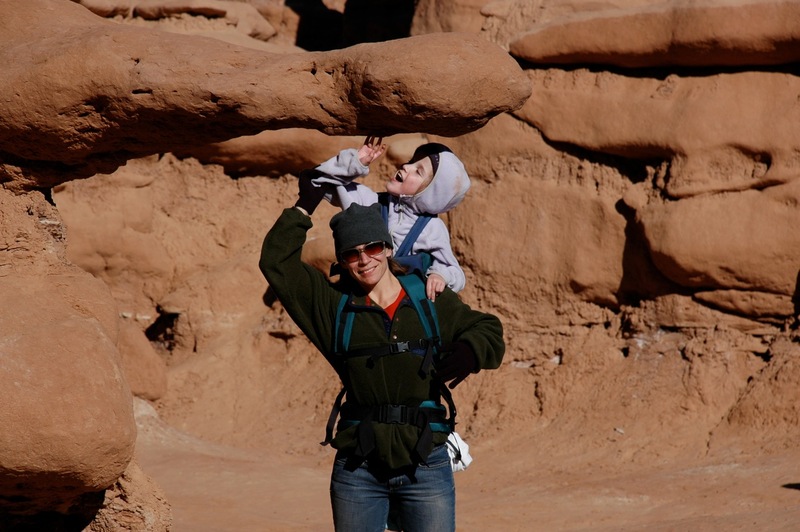 Leah was comfortable living out of her “pouch” and experiencing the world closer to our eye-level rather than from the compartment-like stroller. We wore her through the streets of Boston, on a ferry to and from Martha’s Vineyard, and on the subway in New York City. She snuggled up against us in Los Angeles, at the beach, and most everywhere we went. Aaron and I marveled at how cumbersome those adventures would have been if her main mode of transportation had been a stroller. When Leah was fourteen months old we found out that she was deaf. 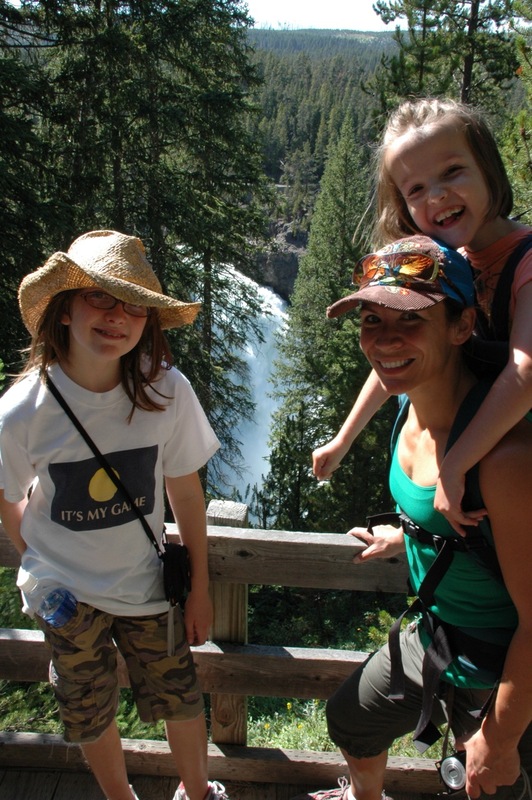 In dealing with her diagnosis I felt all sorts of things, but one thing that I felt was a bit of satisfaction—satisfaction that my child had traveled that first year with the comfort of her mommy’s or daddy’s heartbeat nearby. Even if she couldn’t hear it, she was always close enough to feel it. She took in the world visually from her “perch” even though she was missing everything auditorily. She could see our smiles, feel our kisses and she had the confidence of feeling safe in our arms. We wore her that way until she was over three years old. Our daughter Lucy was born prematurely at thirty-two weeks gestation and weighed 4 lbs 11 oz. She was born with spina bifida, and on top of that was diagnosed with cerebral palsy at nine months of age. The prospect of Lucy ever mastering walking was slim. 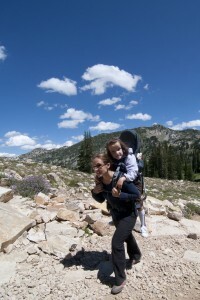 I already knew that we could easily postpone the loading and unloading of a wheelchair simply by carrying Lucy in a sling, though I had no idea how far we would end up taking it…or her. We use a number of different packs and we are continually making modifications. Originally we carried the girls in Over The Shoulder Baby Holders. Now we have a custom Baby Hawk, we call it a Lucy Hawk, a Deuter Kid Comfort III, an Organic Ergo Baby*, and an old framed Kelty pack. 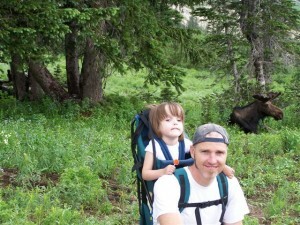 Any time we see a pack that looks useful we get it especially if it’s rated for a child weighing 50 pounds or more. 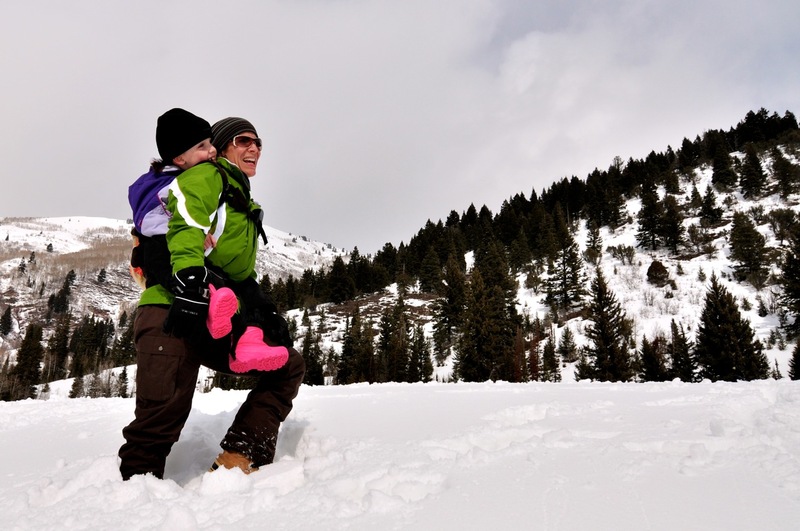 *The Ergo Baby Carrier was given to us for free by the good folks at ErgoBaby. All of the other carriers listed were purchased. 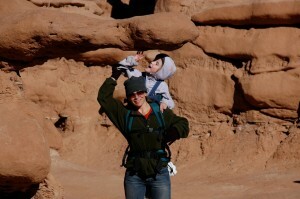 This entry was posted in Crazy Little Thing Called Life, Strong Enough by Rachel Coleman. Bookmark the permalink. I read this article with tears in my eyes – what a beautiful story of strength and perseverance. I wish all moms could feel this strong, unyielding pride in doing something right for their children, even if they feel judged by doing so. Imagine my surprise when I scrolled down and read your info – I have been teaching my two toddlers (aged 3 and 2), ASL with your tv show for the past 6 weeks, because my son said “he wanted to be ready if a new friend couldn’t hear him”. I think your show is wonderful, and your story is beautiful. Keep on keeping on, mama! I don’t normally cry when I read online articles or blogs, but after watching Signing Time and the impact it’s had on my (fully hearing, but selectively mute) daughter, I couldn’t help it. I’ve invited you and you’re daughter into my home most everyday. We’ve danced and sang and learned with you. Reading this, surprisingly, hit me like a family member overcoming challenges. I’ve read your struggles and have seen the strength and perseverance. It’s strange to feel or say this, but I am so proud of you! Way to go Rachel! I’ll be here cheering you on every step and stumble. You may want to look into a Preschool Kinderpack. I’m not sure of the weight limit but, I know it is designed for bigger, older kids. My son is born with Cerebellum Hypoplasia and still isn’t able to walk at age 3. I have been carrying him on my shoulder to go everywhere, but I am afraid he is getting too heavy for me to do so. 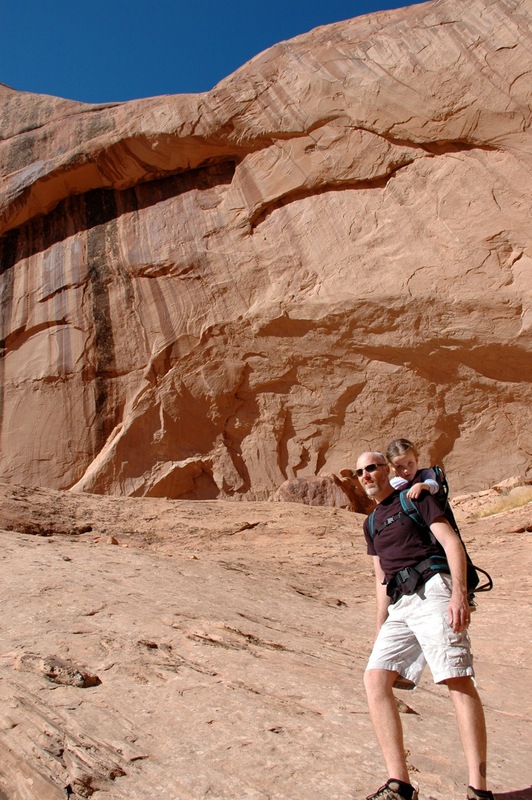 I am in a quest to find the perfect backpack carrier for him and found your site. Thank you for sharing and I will research the brands you mentioned. Keep up the awesome work you have been doing for your little girl. She is way more fortunate than a lot of kids out there. Have you looked at the Lillie baby toddler carry on? They go up to 60 pounds. Could you please tell what carrier this would be from the picture Mammoth Hot Springs Yellowstone 2009? 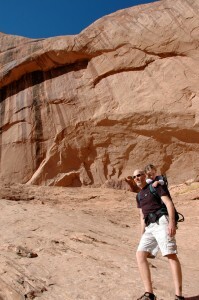 I have a 3 yr old son with DS and runs so in order to keep him safe I’m looking for yet another baby carrier. Child harnesses are OK but he’s still everywhere. looks like the ergo to me. the stars and the cut. Thank you so much for this post! We found out two weeks ago that our baby will be born with spina bifida, and I was concerned that there may be health or safety concerns with wearing a baby/child who is partially paralyzed (one of about a zillion concerns bouncing around my head right now). It’s a huge relief to see that this is one more method available to us to make sure our little one has a full and fulfilling life. 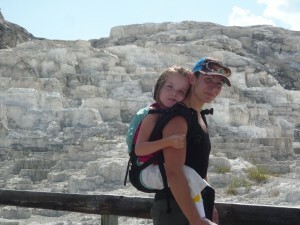 Can you tell me where you got the carrier in your Mammoth Hot Springs Yellowstone 2009 picture? This is so awesome! I’m an AT and avid baby wearer and I’ve been working on a carrier that’s made specifically for families that want to wear their children beyond preschool age!!! You and your family are such and inspiration and we are so grateful to have your Signing Time videos and incredible stories in our lives to help us as our children grow! Thank you for continually letting us into your lives and teaching us something new each time!! I see you said you use the Deuter KidComfort III but the max weight is 48lbs.Where you able to use this beyond that limit? My son is almost 50lbs. Finding this post is like a dream come true for me and my family. We have a 9 year old (42 pounder) with special needs, and our last hiking trip saw us carrying her through very rocky terrain in a jogger that, honestly, is too small for her. It breaks my heart to think that we can’t get out and hike—which we love to do—because carrying Lily is too difficult. But seeing your post has brought back some hope. I’m especially interested in what I’m wondering is the ergo baby in the picture of you at Mammoth Hot Springs, because it looks like it would be a good fit. ANY recommendations would be greatly appreciated!